Casino X Rated X for X-treme! Casino X is a monster in its own right - they have obviously spent plenty of time designing a unique online platform. Where else would you see a Viking forging an invisible sword, near a pretty-looking mermaid, with big bouncing… eyes? This casino surely has a creative staff to make such amazing promo pictures and animations. The casino hosts numerous top-level software providers, including Microgaming, NetEnt, Quickspin, and many others. You can expect to find a massive collection of over a thousand best casino games. This includes both mobile accessibility and live-dealer casino games. The Welcome Bonus spans across your first five deposits! As for the first deposit bonus, you can choose from three different options, with a 100% match up to €2,000 being the most delicious among them. The wagering requirements are 25 times the bonus plus deposit, but they are not specified on the website. This place is huge. Casino X has tons of games, from a wide variety of software companies under its umbrella. 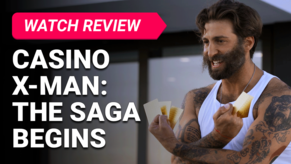 Interestingly, Casino X has somehow been able to incorporate social media networks in with their gambling platform, making it a more social experience. That means you can connect your Facebook or Twitter account right to the site. They’ve also made their website secure with SSL technology. Finally, all of their games meet the standards set and enforced by eCogra. 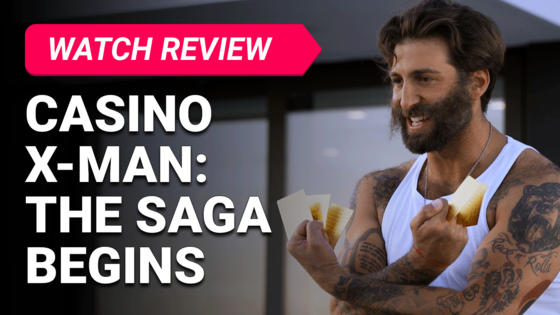 The casino is regulated under the laws of Curacao, which is not the best mark of their fairness, but it didn’t prevent one of their players from winning $350,000 while streaming, not long ago. Casino-X is a beast of a casino with 25 software providers filling up their gaming library. Their website is freaking amazing: you’ll get our point as soon as you take a glance at it. It’s made with love and has all the needed functions for a convenient gaming experience. We’d worship it only for the animated promo headers, but it is great in all other aspects too. Customer Support: If you face any troubles, you can contact the support service via live chat, from 10:00 to 22:00 CET. If something goes wrong outside their working hours, you will have to wait until the agents wake up and get back to work - there is no FAQ on this website. Alternatively, you can send them an email and wait for a response. Banking: The list of banking options is rather long and includes Skrill, Neteller, Paysafecard, credit cards, etc. They also have a standard list of Russian payment options, such as Alpha Bank, Yandex Money, Moneta.ru, and others. The maximum allowed payout is €100.000 per month if anything. Other games: Keno, Spingo, Space Evade. You have nothing to worry about if you spend too much time on the road. Simply load up the casino with your mobile device, and you’ll be in business, just like if you were on a desktop machine. Casino X does have a live-dealer section, allowing you to take part in one of the many variations of Blackjack and Roulette, that they have to offer. Besides that, you can try out Baccarat, Casino Hold’em, Caribbean Stud, and even Dream Catcher. Casino X goes bonkers, as it offers you a five-step Welcome Bonus. On your first deposit, you even can choose between three different bonuses depending on your bankroll style. Fifth Deposit: a 25% match up to €750. Lots of bonuses to be claimed - and with relatively good wagering requirements, too. The wagering requirements aren’t specified, but we have managed to find out the truth. They are 25 times the sum of the deposit and the bonus. Not the best offer, but not the worst either. They also offer tournaments, lotteries, and even some competitions you can take part in. Check them out on their website. Casino X looks like a unique place to play at. You can connect your social media account and play with friends, just as if you were at a real casino. There are tons of games from many top-notch software providers and an absolutely crazy Welcome Bonus. All of that is rolled up into a nice site that is also mobile-friendly. Well done! Click here to get started on that sick welcome bonus!